Matlock had most of the play but could not force a way past a stubborn Frickley side who battled hard to earn an excellent point on Saturday. Expectancy levels were high on the terraces after the Gladiators' midweek demolition of King's Lynn on their own turf, but it was a low key affair for the 322 crowd who turned out on a bright and sunny afternoon. Understandably, Matlock retained the side that had started at the Walks but there were changes on the substitutes bench where Lavelle White and Anton Foster were included. It was nine minutes before either side threatened, with Matlock attacking down the left through Joe Leesley, who found Lewis McMahon, to fire a low shot at goalkeeper Tom Woodhead. Micky Harcourt did well to force Gavin Allott wide as the burly Frickley striker chased a lost cause which Jon Kennedy should perhaps have dealt with more efficiently, but it was soon Town threatening again in probably the best move of the match. Liam Needham fed McMahon, who in turn found Danny Holland who produced a gem of a pass to Darryl Thomas, who saw Woodhead dive to his right to keep out his low drive. A goal then would most probably have seen Matlock go on and win, instead it became an afternoon of frustration. Matlock forced three corners on the trot as they increased the pressure with a David Haggerty (left), header being deflected over and a McMahon shot suffering a similar fate. Another Haggerty header cleared the bar from another later flag kick as Frickley held grimly on to the break. The Gladiators looked intent on coming out of the blocks quickly after the interval with Harcourt's low effort being well saved by Woodhead inside the opening minute. But on 48 minutes, the hosts were handicapped as Lewis McMahon was helped off after a challenge in midfield and left the ground on crutches. James Ashmore tried his luck from distance but Woodhead was equal to the challenge before Holland saw his shot blocked, which led to Frickley breaking quickly for Allott to set up Luke Hinsley whose shot was charged down by Kennedy who was off his line swiftly. Holland then thought he had poked Matlock in front after a 63rd minute scramble but his 'goal' was disallowed, the referee's assistant having his flag raised. That was just about Holland's final contribution as he was doubtful before kick off with a groin strain and was substituted by Adam Yates. Kennedy denied Allott who was given a free 77th minute header from a free kick, the Town number one tipping the ball over before two minutes later, Matlock were within a lick of paint of going ahead. 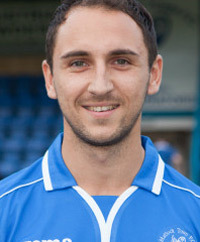 White, who had replaced McMahon, was in behind the Frickley defence and his shot struck the top of the bar. That was it for chances as Matlock needed a little more width on the day to breach a well drilled Frickley defense. Harcourt and Leesley did not get forward as much as Matlock would have wanted and a lot of players had average games instead of outstanding ones. The one consolation for Matlock is a third successive clean sheet.